I got this idea from the Cricut MB. Someone asked for gift card holder templates and another person suggested cutting stockings and leave an opening to slide the card in. I thought that was a cute idea!. 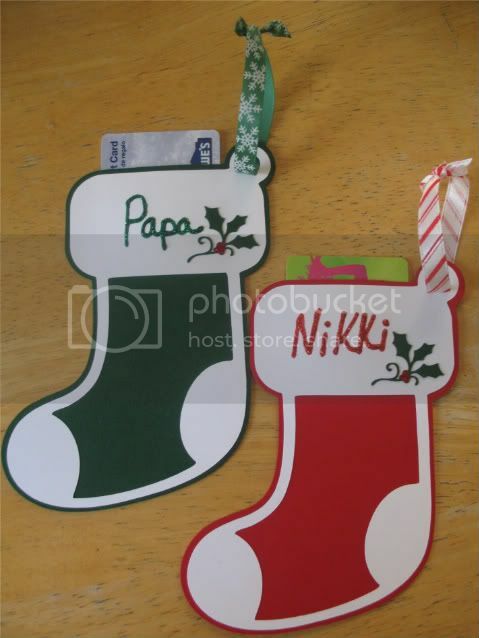 I cut out 2 stockings from the Very Merry tags cart at 7 inches (I only have the baby bug, but used DS and turned the stocking so it would fit). Then I cut out the detail part in white, also at 7 inches. I placed the gift card where I wanted and used Terrifically Tacky Tape and Zig Glue to glue down. The holly came from Joys of the Season--it's the inside cut from the Holly ornament cut. 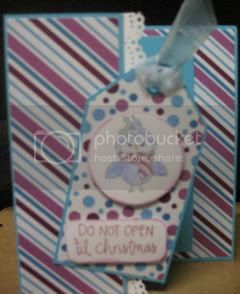 I used the ornament part for tags for sour cream containers last week and had to keep the cute holly cuts! I wrote the names and went over in stickes, of course! The ribbon makes it so it can hang on the tree. Well I finally have a Christmas card design. I was going to use trees (and already cut out 32) but just didn't like where that was going. So I used Winter Woodland for the snowflake and circle. 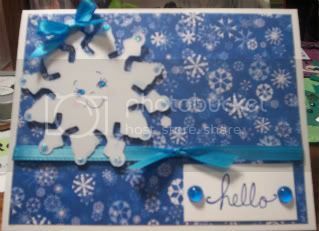 I used snowflake cuttlebug folder for the background but saved some blank space at the bottom for the greeting. Plus I used some Marshmallow glimmer mist, but you can't tell from the picture. I used the Holly stickles to cover the snowflake. I'm using different ribbons--I just don't have enough of one for all of them. I'll probably do some with blue when I run out of green or red ribbon. Easy and quick since I really want to get the cards out the beginning of next week! I found the paper in a DCWV Winter Pack from last year so it would coordinate. The bird stamp is from Peachy Keen--I'd really love to win this one so I can you different stamps on my entries :-) The greeting is from the dollar bin at Michaels. I almost forgot about the border so I used the MS lace edge punch and put it on the inside sticking out. You can see some of it behind the tag which is from George. I had to add some stickles to the eyes and scarf. This is my first time entering a challenge for The Cuttlebug Spot (I just got mine a few weeks ago and only have 3 folders! 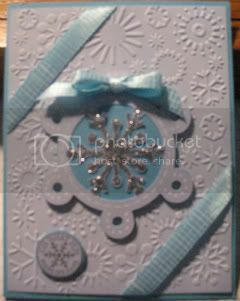 ), but it fit right in with my snowflake card making lately!! The challenge is Brrr...Winter! 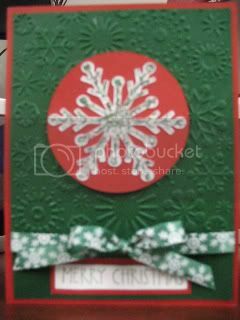 I used some of that fabulous Mica paper and the snowflake embossing folder. I used a snowflake tag for Very Merry Tags cartridge and just added some gold paper to the sides. It was very simple to do, but elegant. It does look so much better in person! I used the base snowflake tag from Very Merry Tags (love this cart!) and the hello stamp is from some cute owl stamps I got at Archiver's. The face stamp is Peachy Keen of course! I keep all my stamps in CD cases and have no idea of the names, sorry. 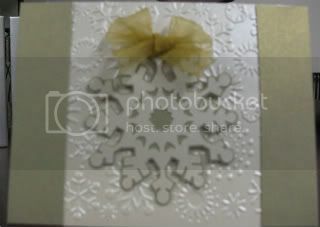 The snowflake paper came from JoAnn's. I added some stickles and skittles. Super easy!! Anything my kids make me! 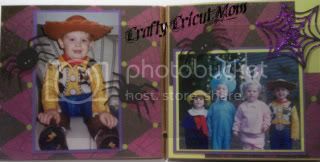 Chipboard albums--they scare me a little. One year I got a lovely blond hair doll in a pretty blue hooded cape. I love Christmas cookies--butter are the best! I am making some glass block lights and not sure what else, but I do need to get started! I love Christmas music!! My fav would probably be Christmas Shoes. Driving around looking at Holiday lights. Thanks to all of our generous sponsors that helped make Mama’s Holiday Wishlist possible! Want to see those prizes in more detail? Click here. The deadline to post and send us an email is Sunday, December 13th. We’ll annouce the winner on Monday, December 14th. Good luck! I didn't use any Peachy Keen Stamps this time (sorry, I really don't have many!) 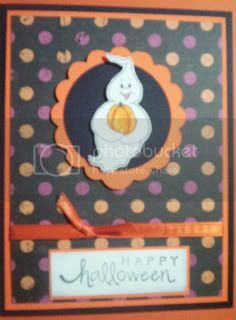 I did use a small Studio G stamp in the corner that says "Oh What fun... Happy Holidays". It matched the design. The snowflake is from the new Very Merry Tags. I used silver stickles on it and white signo pen doodling. And I just got a Cuttlebug--Yeah! !--so I used the snowflake folder for the background. 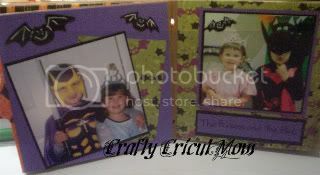 • you can use die cuts, stamps, punches, images on papers... etc.. anything goes! I call this my "cheater card". It's not one the best, but I only had time Friday night to make it. We have a soccer game this morning and things that have to get done before and after. Plus, it's Halloween so that means trick or treating (and my birthday ;-). So a busy day ahead!! 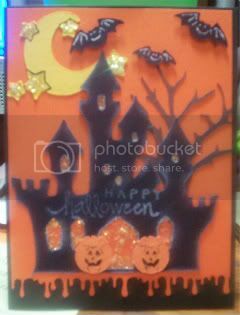 I used Recollections Halloween paper that had the haunted house and ghost already. I cut 3 bats from Paper Doll Dress up. the greeting is Studio G and added the drippy goo behind to match. I added purple stickle dots down one side and bottom. Thanks for looking and I hope everyone has a Happy Halloween!! I made this for a friend's birthday. Her favorite color is green. I also have really enjoyed doing sketch challenges and now check out Mojo Monday every week. This is week 110 challenge. I found this cute green star background paper and thought that it would work with this sketch. I used George and Basic Shapes for the star and did a shadow. I stickled around the shadowed star and doodled white stitching on the green one. 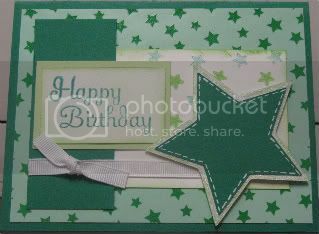 Just used some paper scraps for most and stamped Studio G stars in 2 shades of green. 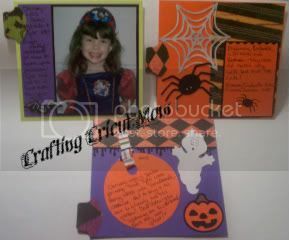 I had made some Halloween cards and never posted them so here they are. All the cuts from this first one are from Paper Doll Dress Up. I think the stamp is from Studio G or some other dollar bin stamp. I also used the drippy goo punch at the bottom. I added stickles to the moon and in the windows and doorways of the castle. This card I just had to use the Hello Kitty Greetings bat. It's so cute! The mat for it is so wide so I added black stickle dots around it. This paper was from a pack in the Target $1 section. Same stamp as above. The Ribbon edges were fraying so I added orange stickles to it and then to the middle of the bow. This card is actually for two challenges. 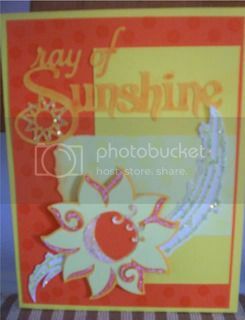 I found the card sketch at http//mojomonday.blogspot.com/ and thought it was so cute!! And I really wanted to particpate in the Peachy Keen Stamps Challenge #14. http://peachykeenstampschallenge.blogspot.com/ So I'm going to enter both!! ***Use the colors PINK AND BROWN as the main color scheme. 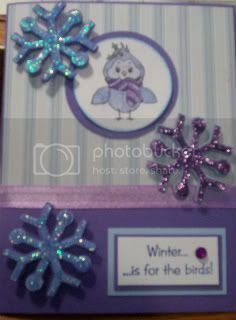 The bird stamp is from Peachy Keen and the round one and snowflakes are from Studio G. Patterned paper is DCWV sweet stack. I did use Stickles on the birds eyes, holly and the snowflakes right around it. The round stamp says warm up with a cup and then hot cocoa--don't know if that will show up very well. I used the Cricut George cartdrige for the rectangle and circle and shadowed them. $250 Shopping Spree at The Scrapping Cottage! 1. Become a follower of the CottageBLOG. (If you are already a follower you met the first step). 2. Post a link to this contest on your blog. If you don't have a blog you can start one at blogspot.com. 3. Leave a comment on your favorite CottageCutz die with a link to your blog using Mr. Linky so we may visit you.We will use Random.org to select the winner as soon as we reach 500 followers. Well, it was another rainy day here in GA and I had to go to work. It really would have been nice if I could have created all day! I wanted to make a card for someone and it needed to be green. This is a bit different for me. I used Celebrations for the presents with the border function and George for the Ovals with a shadow. I think the paper is DCWV. 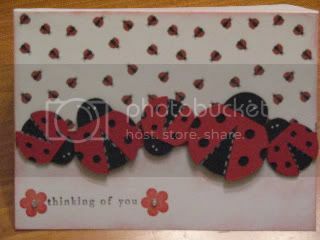 Add some stickles and bling and you've got a card! It really looks better in person. Maybe I can get Santa to bring me a new camera this Christmas! Oh and thanks for the comments!!! I really love getting them! Well, I was going to scrapbook some more today, but just wasn't motivated. I really wanted some animal print paper for the next pictures, but couldn't go shopping today. I'll look next week. So I decided to make some cards. this one is pink--my fav color! I was going to send this to someone this week, but this one isn't right for her. I'll just have to make another!! I really need a new camera--this card does look better in person!! I used Home Decor for the cupcake--I really love it! DCWV Sweet stack is the perfect background paper for it! I stickled the cherry, of course. Back to work this week, so probably won't get many posts in--Have a good one! 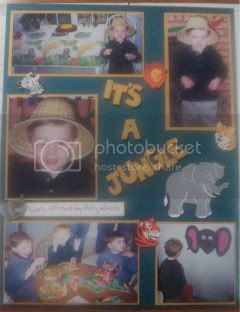 This was my son's 4th birthday party (he's 12 now), so I'm just a little behind :-)! I try to use my Cricut for everything, that's probably why it took me all afternoon to get these 2 pages done! But I think it turned out pretty cute. I used Animal Kingdom for all the cuts and use the cricut markers. I don't do that enough, but I really like the look. I added some animal stickers I had since I didn't have any animal print paper to use. There's no sun today, so the pictures aren't the best. I used Peachy Keen stamps for the bird and the greeting. The snowflakes are from Joys of the Season, layered. Paper is from SU! and DCWV. And of course I used Stickles!! Walt Disney World--love that place! Probably go to a spa and have a lot done! 10. Best food you've ever had while on vacation. Anything is good on vacation since I don't have to cook it!! REMEMBER - Cricut is running another mindblowingly awesome contest called “The Great Gypsy Escape” - they’re giving away over 200 Gypsies, 20 travel packages and a "Cricut Swarm" in one of five fabulous locations. Purchase one of four new Cricut cartridges for a chance to win. Look for winning cards in the new Every Day Paper Dolls, From My Kitchen, Sweethearts or Winter Woodland cartridges. Learn more here. 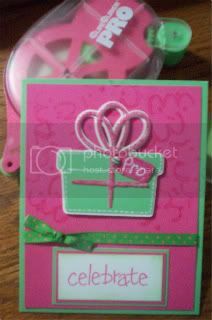 I went over to Today's Mama chat Wednesday night and won the Everday Paper Doll Cartrige!! I'm so excited and can't wait to get it and play. I'm so glad I stayed up past my bedtime! I also got my Bughead on the Cricut Message board this past week so I'm giving away some goodies over there. Stop in and visit!! This is the last week to enter and win a Winter Woodland cartrige--I would love to win this! Help us celebrate our 100th Cricut cartridge—Winter Woodland! That’s right, we reached 100 cartridges. As a thank you for our great Cricut community members we want you to celebrate with us. So, we’re giving away 100 cartridges over the next five weeks (20 per week). Check out the cartridge here and then head over the the Cricut MB to enter! Just a birthday card I made for another contest--maybe I'll win something sometime!!! Anyway, I used the Celebrations Cartridge for the present. I cut a white shadow for it. I've found that I really like shadowing everything!! It's just a simple card, but I thought it turned out kinda cute. Win an Entry in the Grand Prize Drawing for a Workbox from The Original Scrapbox. Enter to win your choice of a Ribbon box or the ScrapMaBob and qualify for the amazing Workbox giveaway taking place on October 12, 2009. Help us celebrate our 100th Cricut cartridge—Winter Woodland! That’s right, we reached 100 cartridges. As a thank you for our great Cricut community members we want you to celebrate with us. So, we’re giving away 100 cartridges over the next five weeks (20 per week). Check it out at the link below!! I made this card based on the sketch from the Peachy Keen Challenge Blog site. I was trying to follow the blog challenge, but this is the 1st one I was ready to make. 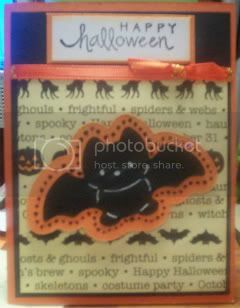 I used Recollections Halloween stack. 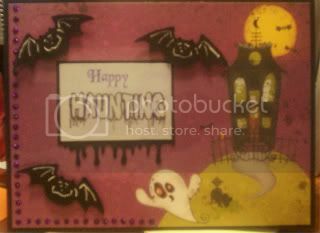 The ghost stamp is from Peachy Keen and Happy Halloween is from Studio G (I think). The scallop and circle came from the Celebrations cartridge. I do love comments, so please leave some!! 3 SUPER acrylic blocks with grid lines and finger grooves, Sizes: 3.5" round, 4.25" round and 8" x 2.5"
I learned how to make the paper bag album over on the Christmas with the Cricut blog. I have always wanted to try this, but didn' know how! 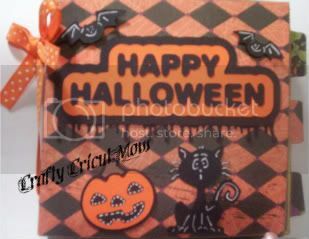 I used 3 bags and the Halloween Recollections Paper. All the cuts came from Doodlecharms, Hello Kitty Greetings, and Paper Doll Dress Up. 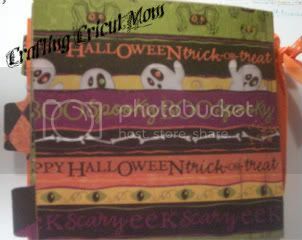 The inserts have tabs punched from a Stampin' Up! punch. I used the drippy goo punch on the cover and one other page. And of course I used Stickles!! Lots of pictures!! Can you tell I would love to win a cartridge from Provocraft?!! Each week we will be posting a thread. When you respond to the thread you will be entered to win. You can enter once by replying and you can enter a second time by posting on your blog about the celebration and linking back to the cartridge product page. So check out the 100th cartridge and join the fun on the message board!! Have fun and I hope we dry out soon!! So I had a day off and all I got done was one card! 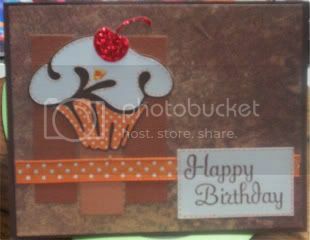 I decided to try this for scrapsketch and I did need a card for someone. My downfall was the colors!! I wanted to use browns/oranges for it and just didn't have a lot to work with. I just had to go to Michael's to get some ribbon. And since I was there some paper, more ribbon, and stamps--LOL!! I used Home Decor for the Cupcake/cherry. 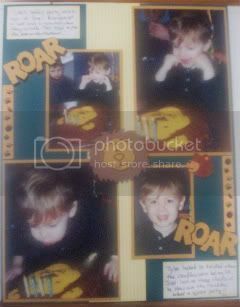 One of my goals is to actually get some scrapbooking done. I just started working on year 2001!! But hopefully, having this blog will help me. 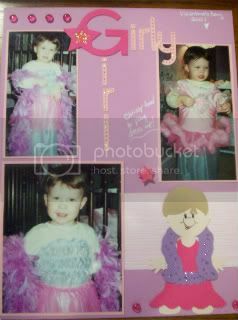 This one is of my daughter--she loved to dress up! I used Hannah Montana Rock Star font for the G and Daddy's Girl font for the other letters. I used the Prom Girl for the Paper Doll. I used Skittles for the 1st time and of course, stickled the letters and doll. Watch the HSN/Provo Craft launch of the new Gypsy on September 24th starting at 12 AM. Cutting Above is THE new place for industry news, review information, tutorials, videos and just about anything else related to scrapbooking and die cut machines!! Check them out at CuttingAbove.blogspot.com!! 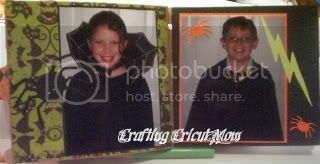 I decided that my blog should have some posts, so I've been going through my Photobucket pictures to see what I have. I've made these cards in the last few months. This one was one of my favorites. I just love Doodlecharms!! These ladybugs came from that and I just found the paper in my stash. 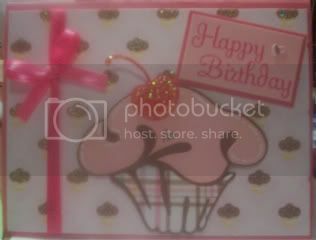 I just loved this card. All the cuts are from the Tinkerbell cartridge. I just really liked the colors. You can tell I love stickles--I use them on just about everything!! I got the Home Decor cart when I saw someone use this cherry. I also love the cupcake. I do want to play with this cartridge some more with some of the other cuts! The picture is a little blurry. Now that I have a blog, I'll have to do a little better!! The paper is from the DCWV Sweet Stack. And I completely stickled that cherry!! Well today was my son's 1st game of the season and it was a win!! Yes!! Most of the boys have played together for a year, but this was the 1st game in the next age group. Now that we have a game every Saturday, it will be even harder to get any creating done!! (And it doesn't help that I'm team manager.) But I'm going to try. A Gypsy sure would come in handy for those weekly practices!!!! Help us celebrate our 100th Cricut cartridge—Winter Woodland! That’s right, we reached 100 cartridges. As a thank you for our great Cricut community members we want you to celebrate with us. So, we’re giving away 100 cartridges over the next five weeks (20 per week). Here’s how it will work. Each week we will be posting a thread. When you respond to the thread you will be entered to win. So follow the above link to check out the 100th cartridge.